Our journey started with a short briefing at the La Viña Hotel in Zamboanga City to apprise us of the specific itinerary to Bongao, the capital of Tawi-Tawi Province, and to this municipality, which is composed of six islands, namely, Taganak, Baguan, Great Bakkungan, Langaan, Lihiman and Boan. From that briefing we learned that Baguan Island is a strict protection zone where no one is allowed to establish his abode; it is the place where the most number of turtles are nesting. Mr. Cidur Julsadjiri of DENR-9’s Protected Area and Wildlife Division (PAWD), who presided over the meeting, said a navy boat would take the group from Bongao to the Turtle Islands and back. We arrived at Sanga-Sanga Airport at 7:15 a.m. of Sept. 5, fetched by an easy ride to Bongao Port where the navy boat, Philippine Ship 19 (BRP-Miguel Malvar) led by Commanding Officer Jeff S. Nadogo, was waiting. The boat left Bongao Port at 1p.m. to start a 16-hour voyage to Taganak Island where the seat of government of the Turtle Islands municipality is based. The boat sailed afloat the rough seas, negotiating the giant waves. In the middle of the sea, at around 1:20 a.m. of Sept. 6, a boisterous wind suddenly came, waking up all those lying on the boat’s steel floor to warn of a coming rain. A few minutes later, raindrops started falling ensued by a downpour. My colleagues and I scampered to the boat’s mess hall, carrying our bags, laptops and cameras to avoid getting soaked in the rain. At around 7a.m. of Sept. 6 we finally reached Taganak Island and Mayor Mibaral M. Tang met us at the Municipal Guest House, which is situated along the beach where the turtles lay their eggs each night. Taganak Island is one of the protected areas covered under Presidential Proclamation 171 that allows scientific research and monitoring in the area but prohibits turtle egg collection, destructive fishing methods, killing and/or gathering of protected wildlife, and illegal or unregulated commercial fishing. Protected Area Superintendent Minda J. Barullan told this writer that the strict protection zone covers 242,697 hectares with a land portion of 318 hectares. 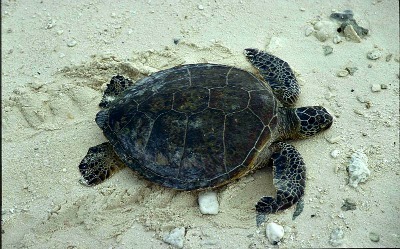 Barullan said the data on nesting incidence in the protected area showed that 7,465 turtles nested in 2008, 10,231 in 2009, 14,035 in 2010, 20,274 in 2011, 21,703 in 2012, and 17,290 in 2013. “The number of turtles nesting in 2013 went down due to poaching and illegal fishing,” she reported. Green Sea Turtle (Chelonia Mydas) and Hawskbill Turtle (Eretemochelys Imbricata) are the two kinds of sea turtles endemic in the area, said Kester Yu, executive director of the Turtle Conservation Society of the Philippines (TCSP), a non-government organization doing research on Turtle Islands. Yu and some researchers of the Philippine Center for Terrestrial and aquatic Research (PCTAR) joined the voyage. Yu also disclosed that there are seven species of sea turtles all over the world; five are seen in the Philippines and two of these are found in Turtle Islands. Though tired and weary from a long trip, we endeavored to stay awake from 8 p.m. to 11 p.m. to watch female turtles dragging with their flippers up from the seas to the shorelines to nest. On that night we saw three female turtles lay eggs under Agoho and Talisay trees, just a few meters from where we were billeted. In the afternoon of the following day, Sept. 7, we proceeded to Baguan Island, an hour ride away from Taganak Island. When we reached there, we could not help but fall in love with the island’s beauty. Pristine beaches and crystal clear water welcomed us, as our eyes got awestruck by the sight. There we have validated the report that Baguan Island is, indeed, home to the most number of turtles. On that night alone, we had witnessed more than 20 female turtles nested on the beach fronting the DENR’s building. According to a DENR staff assigned in the island, an average of 80 female turtles come to lay eggs here every night. However, rats and rodents are a new threat to this nesting ground, as they are eating the turtle eggs. To curb the problem, the DENR personnel tried to poison the rats. Another threat that poses a danger to the turtle islands is climate change. Mayor Tang stated that the seawaters have already eroded the shorelines of Taganak Island. He showed us several Agoho trees uprooted by seawaters – a clear indication that the seawater rise is now felt and observed in the area. From its original land area of 135 hectares, the island has been reduced to 116 hectares in recent years. Dr. Filemon Romero, an expert in oceanography, said, “there is really recession of seawaters inward,” which means that the sand and soil along the shorelines get eroded due to seawater rise.